You make your clients look and feel great. You soothe them and comfort them. When they are in your care, nothing can go wrong. Their skin and hair and well-being are completely covered. And you want a WordPress theme that lets everyone know that’s what to expect from you. You can get a WordPress theme pretty much anywhere these days, but if you’re looking for the best of the best, right? Because you are the best of the best. 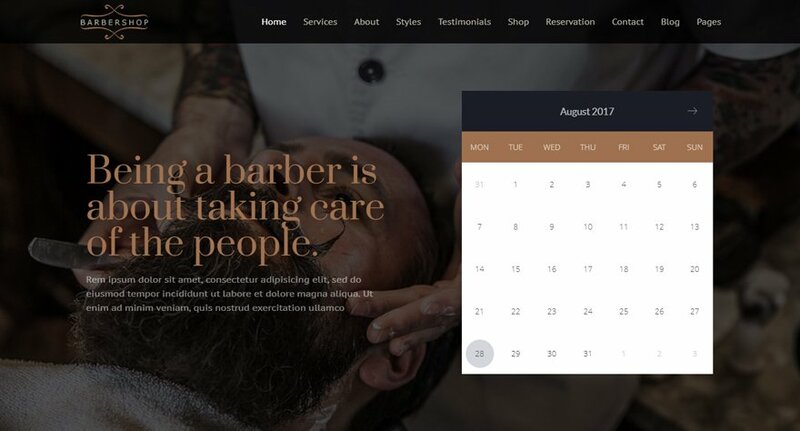 So we’ve taken it on ourselves to put together a collection of what we think are the best WordPress themes for spas (and hair salons and barber shops, too!) so that when clients are looking to pamper themselves or for you to pamper them. Mandala is a fantastic theme for a lot of reasons, not the least of which how clean and simple it is. 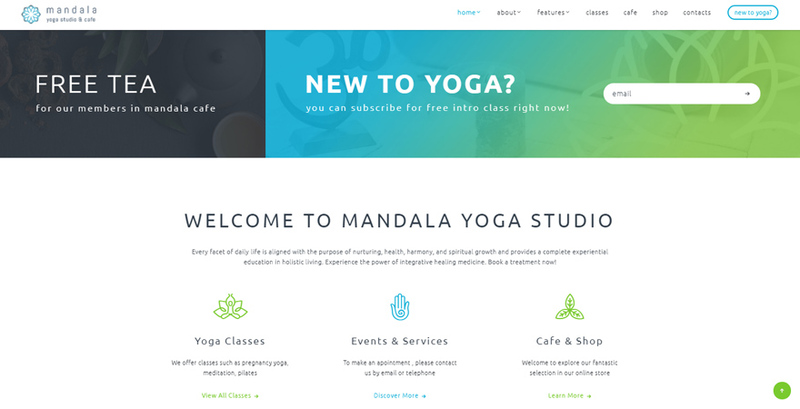 Designed for yoga studios, but perfect for day spas and others, you get built-in compatibility with popular plugins like Revolution Slider and Visual Composer that let you get your best design online quickly so that your clients don’t miss out on you for a second. Bluete is a pretty cool theme that comes packaged with multiple color swatches, built-in Google Fonts (that are already paired for prime aesthetics), and pre-styled WooCommerce pages. Add in plugins like Visual Composer, and you’re looking at one heck of a deal for your salon. When you name your theme Beauty Hair Salon, you pretty much know who your customers are going to be. 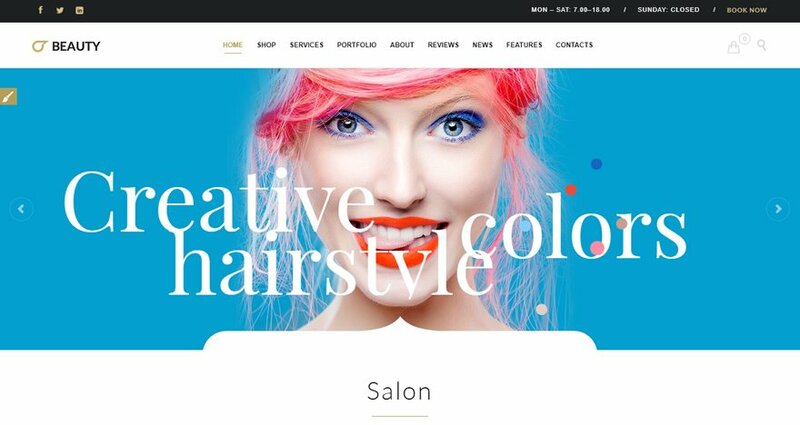 This one comes with 5 unique home pages, so no matter what your salon or spa specializes in, you will have something that represents your brand. What’s also super great is you get a built-in appointment booking plugin called Booked, which will totally change your way of doing business–for the better. X is actually a page-builder theme, but I wanted to include it here because of how it approaches the niche. While not specifically designed for spas or salons or barbers, X is built on top of what the devs call stacks. Each stack is a particular style of site, from e-commerce to portfolio and magazine, and they’re all incredibly simple to adapt to what you need. You use the Cornerstone editor to put in content and design the pages, so no matter what, your clients are going to feel at home with you. With 5 versions of the home page (including one that specializes in scheduling), Wellness Center may just be what your wellness center is looking for. It’s built-in appointment booking functionality is great, and the inclusion of Revolution Slider makes the price even more competitive as one of the best WordPress themes for spas. Hip, modern, and edgy, Coiffeur takes a different approach to beauty themes than a lot. While many lure in visitors with bright colors and sleek contrast, this theme opts for a darker and more elegant look. You get 6 customizable home page, custom post types, and pre-styled pricing tables, along with over 20 interior page templates. And a custom booking form? Sold. Once again, a built-in booking calendar makes this theme stand out above many others. It’s pretty, clean, and uses shortcodes to ease you into making the best site you can for your clients. What really makes The Beauty Salon stand out to me is the inclusion of the layout’s PSD files, so you’re not locked into anything that you don’t already love. Definitely one of the best WordPress themes for spas, Serenity is just gorgeous. I am not sure what else to say other than that. This theme focuses on ecommerce, but that is also very likely something you will want to get into with your business. With the option for a single-page landing site, too, you’ll be able to show off your best side to your clients. Responsive, high-quality design, and Visual Composer comes bundled with the theme. 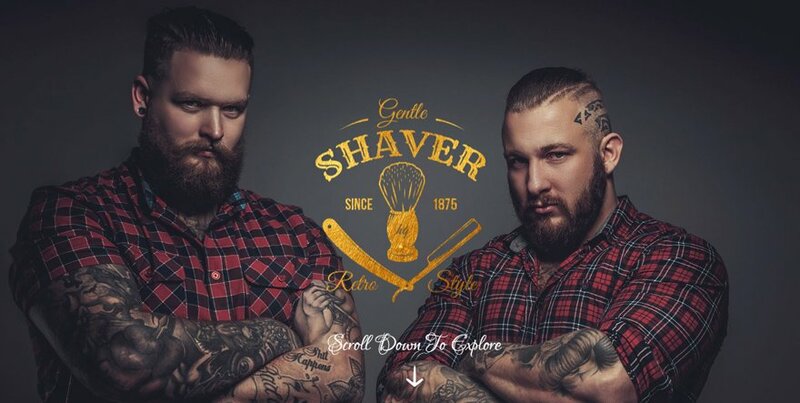 Between online booking, ecommerce, and oodles and oodles of styles to choose from, Shaver is your one-stop barbershop WordPress theme dream (say that three times fast. I dare ya!). From torn edges on sections to a dark, earthy aesthetic, your shop never looked so classically hipster. And its Retina options are on a toggle, so you can customize for your own clientele. Let the tagline of the theme tell you why it’s one of the best choices for you: Being a barber is about taking care of the people. You want a theme that will take care of your clients as well as you do. With 3 different landing pages and 6 separate interior pages to choose from, this theme’s got you covered. Beauty Center has something going for it that none of the above themes do: it’s totally free. Standing out among a ton of free themes that aren’t worth your time, Beauty Center is special by having multiple layouts for your home page, different widget orientations, and a clean look, on top of having 7 page themes. Definitely worth a download to see if it works for you. As a theme, Berger is simply delightful. 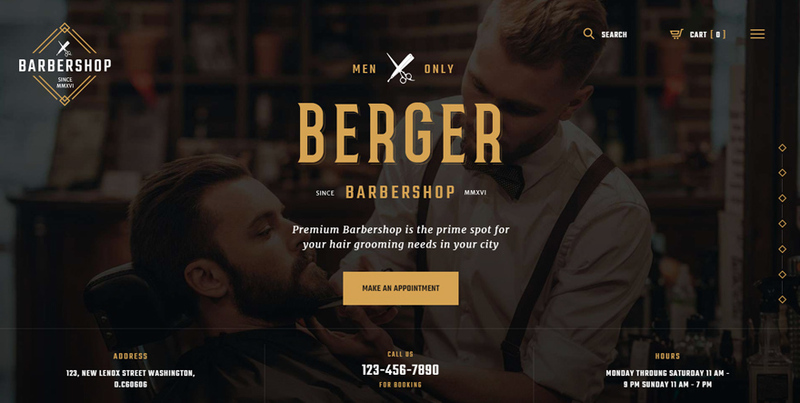 It does pretty much everything you’d want out of a barbershop theme, from elegant design, drag-and-drop editing, and using the Booked appointments plugin for online scheduling. You’ll be ready to open up shop pretty much immediately. VW Spa is a pretty simple theme to use. No-nonsense and functional, it has a slider, some widget areas, and pricing layouts. If you’re looking for a theme that is quick and easy to get your spa online with, this may be it. Who loves free stuff? You do! I do! We all do! 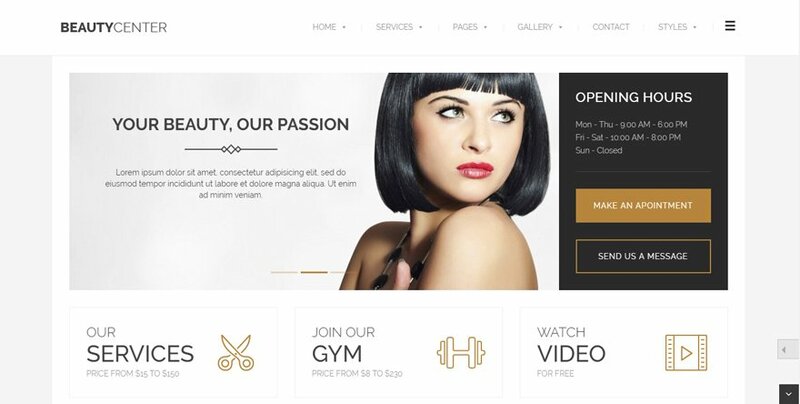 Spa and Salon is one of the best WordPress themes for spas–it also has a premium version, so keep that in mind, too. Like most free themes, you don’t have all the features unlocked, but there is still plenty of customization allowed that you can really see what you and your clients will need before upgrading to this one’s pro version or looking at another theme. If you’re already an ET member, you probably know about the awesomeness that is Divi. If you’re not a member, you definitely should check out becoming one. You get themes, email and social plugins, and the Divi page-builder that can be used with any of the themes above, too. How’s that work for ya? Admittedly, we’re a little partial to the Divi theme. But honestly, there’s a reason. Divi as a theme and page-builder give you unprecedented control over your content. More than that, Divi and your salon are built on the same foundation: beauty and elegance is what matters. It’s sleek, classy, and modern. If the goal for your business is to show your customers that you understand aesthetics, you really can’t go wrong with Divi. I totally think this is one of the best WordPress themes for spas and salons to use, even beyond this being from Elegant Themes. It’s just good stuff. Relax, Breathe in, and Treat Yo’self! 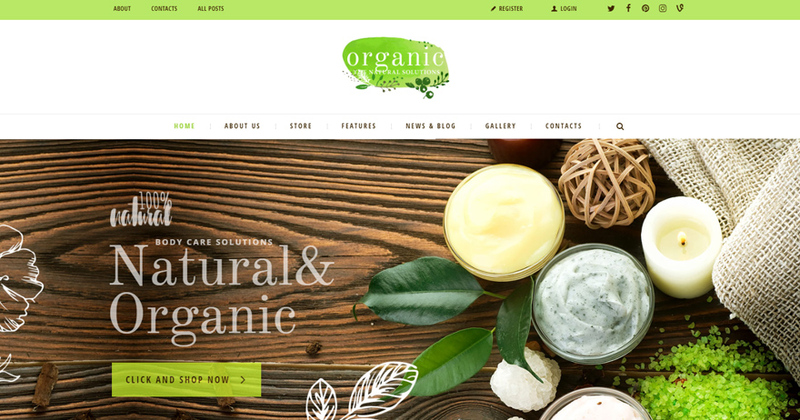 It isn’t always easy to pick between the best WordPress themes for spas. There are just so many! You can’t really make a bad choice if you go with any of these. It will depend on whether you’re looking for an edgy and modern theme or maybe a relaxing, cool one. What do you look for when picking a spa or salon online? Are there features as a user that you value over others? Let us know in the comments! Does Divi offer e-commerce, too? Great post, it gives so many ideas about the themes you can use. We also deal with WordPress web design and development. I am really sorry but I cannot agree with you. Last Update	29 December 16. 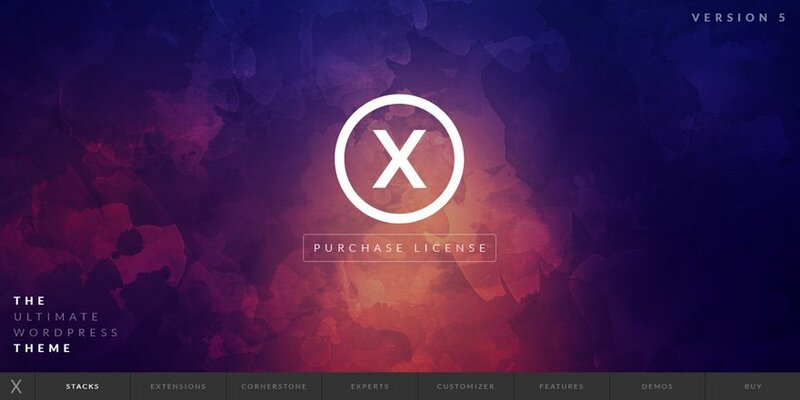 X | The Theme, Beauty Hair Salon and Divi. Other themes are not really the best choice. So late post but very intresting post. 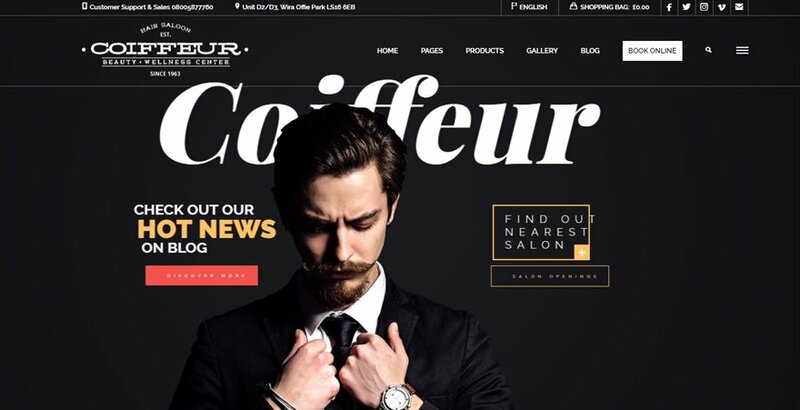 Nice lists, really love that theme but this one is good for me “Coiffeur” wordpress theme. Great. I am having difficulty finding the theme for my website. Now I have found it here. Thank you for sharing it. Do not know where is the best choice?